Earlier this month, Khaleda Zia, the former Prime Minister of Bangladesh was committed to stand trial with her son and other top ranking officials for embezzling approximately 300 000 dollars which was originally intended to build a state orphanage. Zia, who became the first female Prime Minister of Bangladesh in 1991 and who was ranked number 33 in the Forbes list of the world's 100 most powerful women has certainly dropped from glory. The circumstances giving rise to the charges were that the plaintiff alleged that the accused in collaboration with each other misappropriated Tk 2,1071,643 belonging to Zia Orphanage Trust. The accused withdrew the money through cheques from November 11 to March 28 in 2007 from Prime Bank, New Eskaton Branch in Ramna, where Tk 2 crore was deposited in the account of Zia Orphanage Trust. Tk 1071,643 comes as interest against Tk 2 crore. A foreign firm in 1991 donated $ 12,55,000 (then equivalent to Tk 4,44,81,216) for the welfare of orphans. The then BNP government deposited the money with a bank and kept it till 1994, according to the case details. The amount increased to Tk 5.3 crore with interest in four years. The prime minister's office later distributed the money in two separate projects in Bogra and Khulna districts under the name of Zia Orphanage Trust, the case statement said. Of the Tk 5.3 crore, the accused embezzled around Tk 2.11 crore from the trust, according to the statement. The plaintiff in the case statement alleged that though there were hundreds of orphanages in Bangladesh, the then BNP government did not distribute the money among them. With a view to misappropriating the money, the then prime minister Khaleda Zia formed Zia Orphanage Trust, which was registered at the sub-registry office in Gulshan in the city on September 5 in 1993, according to the case details. The address of the trust was mentioned as House No-6, Shaheed Mainul Road at Dhaka Cantonment, which is the residence Khaleda Zia and her family members. Born in 1945 to Iskandar Majumder, a businessman, and Taiyaba Majumder at Dinajpur district in north-western Bangladesh, Zia's eventual rise to political power could hardly have been predicted. According to records she got married in 1960 to Ziaur Rahman, a prominent war hero who himself later became the President of the Republic and formed the Bangladesh Nationalist Party (BNP)in 1978. However, unlike Hilary Clinton, until the assassination of her husband in an abortive military coup in Chittagong on 30 May 1981, Zia had taken little to no interest in either politics or public life. From all reports, even when her husband was propelled to power after the political changes in 1975, "she remained a shy and withdrawn housewife who devoted most of her time grooming up her two sons". After the assassination of her husband, Vice President Sattar took over the reigns of the BNP party and acted as President. This however was short-lived after a successful military coup of sorts headed by Chief of Army Staff General H.M. Ershad who proclaimed martial law on 24th October 1982. In 1983 Sattar appointed Zia as Vice Chairman of the BNP party and when he retired in February 1984 Zia took over the leadership. So that it would appear that her ascendancy to the leadership of the BNP party came less through the dint of hard work but more by a quirk of fate! However, how this woman handled this new power initially was impressive, even if one shuns her as a role model given these allegations. Zia was seen to work hard as leader of the opposition to regain political power for the BNP party. Records of the early days of her rise demonstrate effective leadership and resolve on Zia's part. "She stood resolutely, took the reins of BNP and with like minded pro-democratic parties and elements, formed the 7-party Alliance and started uncompromising resistance against the usurper of people's rights. In the Parliament elections that followed on 27 February 1991 under a Non-Party Caretaker Government, Begum Khaleda Zia led her party to a thumping victory, herself emerging as the most popular political leader of the country. On 20 March 1991 she was sworn in as the country's first woman Prime Minister in a Presidential form of Government. Respecting the wishes of the people, Begum Khaleda Zia and her party took the lead in switching over from the Presidential to the Parliamentary system of Government in order to give the hard-won democracy a permanent institutional shape. She formally took over as the Head of Government on 19 September 1991 under the Parliamentary system. Begum Zia's Dall-Bhaat (lentil and rice) approach received both regional and international acceptance as a tangible programme for poverty alleviation in SAARC countries as well as in other developing nations. She became Prime Minister for the second consecutive term after the February 1996 general election. 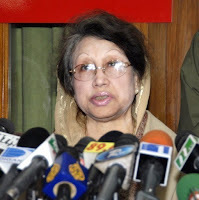 Her party BNP restored the parliamentary system through the 12th amendment to the Constitution in 1991 and introduced the Caretaker Government for holding neutral and free election through 13th amendment to the Constitution in 1996. The government of Khaleda Zia made tangible progress in empowering huge rural womenfolk in the countryside. Her government brought about major reforms in the education sector that included introduction of compulsory free primary education, free education for girl students, stipends for the girl students and food for education programme. Side by side, she initiated bold reforms to revitalize national economy, accelerate production in all sectors and to alleviate poverty. Agriculture, the mainstay of Bangladesh's economy, was given the main thrust to achieve autarky in food production in the shortest possible time. Promoting good neighbourly relations, strengthening regional cooperation within the ambit of SAARC, strict adherence to the UN Charter and furthering world peace and amity were the cornerstones of her government's foreign policy. ‘Engendering Development’, there is a strong relationship between relatively high levels of female involvement in public life and low levels of government corruption. The report concludes that this finding lends ‘additional support for having more women in politics and in the labor force – since they could be an effective force for good government and business trust’ (World Bank, Engendering Development, 2001:96). In the Western world, with the evolution of the feminist movement and the growing empowerment of women, there has been increasing involvement of women in politics. If one were to look at the Scandinavian countries we see 40% representation by women on the legislature and in fact this is the highest political representation of women in the world. Followed by, interestingly enough, leaders in the Asian continent. So I wonder, is it that women in Asia are further along in terms of equality and non-discrimination in the political sphere or is it as Stanley Wolpert describes it an “accident of gender” or as Shakespeare would say having "leadership thrust upon them"? One study singled out a commonality in these Asian women leaders as being the manner in which they came into office in the first place. In most cases, like Zia, these women are victims of the violent death of a close male relative – a husband or father. And it has been said that even in the case of exceptions where they were groomed for the highest office it was not by their ability alone but more by reason of their proximity to male rule. 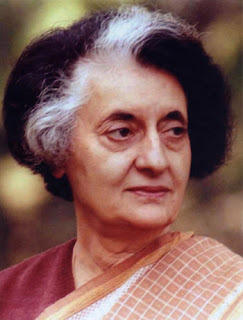 Indira Gandhi, for example, was the daughter of the illustrious Jawaharlal Nehru who died a natural death. Benazir Bhutto assumed the mantle of the Pakistan People’s Party after the hanging of her father Zulfikar Ali Bhutto by the military leadership. While Indira and Benazir had some amount of political experience the others like Chandrika Kumaratunga of Sri Lanka, and Zia lost their husbands, both politically significant members, to assassination. Accident or not, it would seem that Zia, if the allegations are proved to be true, despite her commendable strength, vision and determination exhibited throughout her leadership, may put the lie to this myth that women are less corrupt than men.